As part of the HLF funded Written in the Landscape project, liveArgyll Archives and the Argyll Papers at Inveraray Castle are delivering a local history workshop on Tuesday 16 April, 7.30pm, in Room 1 Helensburgh Parish Church. 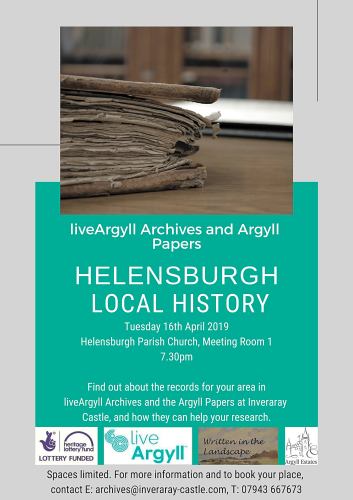 Archivists will introduce both collections and the types of records held in them, focussing on the documents we hold which contain evidence about the history of Helensburgh and Dunbartonshire. There will be plenty of time for questions and for getting ‘hands on’ with the original records that we will bring with us.